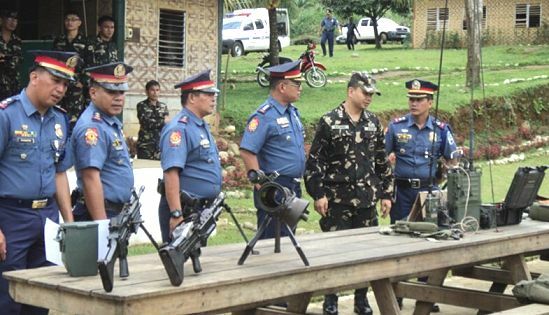 LTC Joel Alejandro S Nacnac INF (GSC) PA flanked by PNP officers during the presentation of unit equipment and capabilities on February 22, 2012. KANANGA, Leyte – The Army’s 19th Infantry (Commando) Battalion received some 26 police key officers and non-commissioned officers from the Leyte Provincial Police Office (LPPO), City Police Offices of Tacloban and Ormoc and the 8th Regional Public Safety Battalion (8RPSB) during the monthly Joint Peace Security Coordinating Council (JPSCC) meeting held at its camp yesterday. The event was the first meeting ever set after the official signing of a Memorandum of Agreement (MOA) on the creation of JPSCC which was ably participated by the 19th IB, Leyte Provincial Police Office, Southern Leyte Provincial Police Office and City Directors of Tacloban and Ormoc on February 16 last year. Lt. Col. Joel Alejandro S. Nacnac, commanding officer of 19th IB remarked that the JPSCC meeting was conducted for the military and the PNP to have common understanding on the implementation of plans and programs in connection with the maintenance of peace and order. With such tool, he hoped to forge stronger relation with the Philippine National Police. “The military and the PNP should be one against insurgency, criminalities, emergencies and disasters. If we tie up our resources, we could accomplish more.” Nacnac maintained. During the meeting, the participants received detailed updates on calamity, disasters and insurgency threat situation in the operational area of 19th IB. Likewise, respective police offices presented their briefings on their unit mission, crime situation, most potent threat, current thrusts and recommendation. Accordingly, the founding of JPSCC was beneficial to both agencies being an avenue of crafting policies for Internal Security Operation (ISO). In his message, PSSupt Wilson Caubat, Police Director of the Tacloban City Police Office (TCPO) stressed that his office will coordinate and support the 19th IB’s effort especially with Internal Security Operation (ISO). Similarly, PSSupt Raul Saysay, commanding officer of the 8th Regional Public Safety Battalion based in Capoocan, Leyte committed sizeable police personnel to be augmented to 19th IB in case of eventualities and during civil-military activities. After the meeting, Lt. Col. Nacnac showed the participants static display of equipment and capabilities of 19th IB in both combat and non-combat operations. He concluded by saying the Army’s 19th Infantry Battalion was honored to have hosted the first JPSCC meeting of the year. CALBIGA, Samar – With the end in view of fast tracking the commercialization of cassava and upland rice in Samar Island which is piloted in Calbiga, the key players in the collaborative project recently met to map up a work plan indicating the specific strategies to be undertaken this year. Department of Agriculture Region 8 Director Antonio Gerundio informed that the two-day Planning Workshop and Collaborative Meeting held at the Spark Function Hall, Calbiga, Samar on February 16-17, 2012, was in by representatives from the National Agribusiness Corporation (NABCOR), Department of Agriculture-8 (DA-8), farmers’ associations, Municipal Social Welfare Development (MSWD) and the Local Government Unit (LGU) of Calbiga, who are all committed towards pushing for the production of upland rice and cassava from home-consumption level, to a surplus, commercial scale in the Samar Province and exploit their huge market opportunities. The strategies were focused on the provision of inputs, infrastructure and mechanization and the conduct of technology-transfer activities/training and information, education and communication (IEC) approaches. The project, which forges public-private partnership concept, has been initially implemented in Calbiga, Samar last year and is determined to expand eventually to cover the entire province of Samar. It was conceptualized as a strategy for achieving sustainable rural development by piloting the municipality as an agribusiness model that will exploit the opportunities available, the commercialization of upland rice and cassava, towards achieving sustainable rural development. “Rural development is all about intensified food production and market linkage. Today, the actors who can make these aspects of the value chain work shall join forces for development to come into fruition in this part of the region,” DA-8’s Regional Executive Director Antonio G. Gerundio said during the launching in august last year. Techno-demo farms have already been established in Calbiga for the two focus commodities showcasing the appropriate farming practices and at the same time, serving as an area for varietal trials and propagation of planting materials. For cassava, 5 of the 20-hectare techno-demo are already planted with the crop, Mr Allan Gojoco, the project manager said. Overall, the project aims to cover 500 hectares for upland rice and 2,500 hectares for cassava. “With this target, we hope to raise the average yields of upland rice and cassava from 1.8 tons/ha to 3.0 tons/ha and from 3.07 tons/ha to 12 tons/ha, respectively,” Project Head Ms Melody de Guzman revealed. Samar Island is among the more depressed areas in the country, yet possesses great potentials for agribusiness development. Upland rice and cassava are two traditional crops grown in the island, but largely for home consumption. The local market potentials for both crops are tremendous, especially cassava which is a critical input for animal feeds. This undertaking of improving the productivity of upland rice and cassava in Calbiga runs parallel to the thrusts of the government on attaining rice sufficiency by 2013 and addressing critical gaps in food sufficiency by making cassava as an alternative staple crop and substitute for rice. Calbiga is known to produce upland rice cultivars that demand high value or premium price due to its unique taste and aroma as well as cassava as food and feeds. QUEZON CITY – Sensing hesitation from the Department of Education (DepEd) on using the child’s first language or the child’s mother tongue in teaching, a lawmaker championing the Mother Tongue-Based Multilingual Education (MTBMLE) system has called on Sec. Armin Luistro to get rid of the old language of instruction and implement mother tongue-based teaching in the first 6 years, at the least, of elementary education. Rep. Magtanggol Gunigundo, 2nd District of Valenzuela, laments that DepEd is still married to the current bilingual system of teaching, without minding that Filipino children’s performance in school are among the worst in the world. In his privilege speech delivered yesterday, 21 February 2012, during the celebration of the International Mother Language Day, Rep. Gunigundo urges Sec. Luistro and his department to look closely on the situation and listen to what the children feels about the current educational system. “I urge the Secretary to send his people to the field, make them interact with the teachers who are faced with the challenge of teaching school children in the language that they do not understand,” Rep. Gunigundo said. As the principal author of HB 162 titled, “The Multilingual Education and Literacy Act,” Rep. Gunigundo is pushing for the use of the child’s first language as medium of instructions in school for eight years, as opposed to what the DepEd is posed to implement. “I am strongly opposed to the implementation of MTBMLE until grade 3 only, because international research have shown that six years of teaching in mother tongue is an absolute minimum,” explains Rep. Gunigundo. “K+12 with 3 years of MTBMLE is weakest and least desirable set up for functional literacy goals and acquisition of second language purposes,” he added. “Unless they have studies to prove that three years of mother tongue language of instruction is better than the eight years, then I will retract my stand and will support them,” he said. “Until then, the school performance of children will continue to suffer,” warned Rep. Gunigundo. TACLOBAN CITY – Three local government units in Eastern Visayas have availed of the Salintubig project of the Department of Interior and Local government, Ms. Ofelia Pido, focal person for Salintubig in the Region informed. Ms. Pido identified the three waterless municipalities as San Isidro in the province of Leyte, Laoang in Northern Samar, and Taft in Eastern Samar. The three municipalities are the recipients for 2011, Ms. Pido said, and they have yet to comply with all the requirements in order to avail of the P10 million water system project. Ms. Pido informed that a coordination meeting was conducted among DILG, DOH and the LGU beneficiaries last week in order to facilitate the fast tracking of the submission of the requirements including the Feasibility Plans and the Program of Work. The said LGUs pledged that they will complete the requirements in March and by June, faucets must already be in place at the waterless municipalities. Ms. Pido added that for the year 2012, the LGU beneficiaries have been identified by the DILG. She however, did not identify the LGUs as they have not been informed yet. These beneficiaries will undergo workshop in the preparation of feasibility studies. A Memorandum of Agreement (MOA) in December 2010 was entered into by the representatives of the DILG, Department of Health (DOH) and the National Anti-Poverty Commission (NAPC) for the implementation for water supply or Salintubig (Sagana at Ligtas na Tubig para sa Lahat) program. Under the agreement the DILG will be responsible for the capacity development requirements of the LGUs and water service providers for the planning, development, management of the water utility services of the Salintubig Program. The province, municipality, and agencies which will implement the water supply projects will do the feasibility studies and engineering designs, civil works construction, and management of the facilities. NAPC will conduct the monitoring and evaluation and will submit the reports to the Office of the President. DOH will be in charge in the implementation of the infrastructure component including the review, approval, and funding of the water supply systems. The Salintubig project will provide a water supply system in the municipalities and also to waterless barangays, health centers, and resettlement areas. For 2011, the Program covers 115 waterless municipalities, 62 waterless barangays, 55 waterless health centers, and 24 waterless resettlement sites, using the P 1.5 Billion Funds released to DBM. For 2012, the Program will be transferred to DILG and will cover 150 municipalities, 43 barangays, 46 health centers, and 12 resettlement sites. Under the Salintubig Program, there are two thematic areas. The first is the poorest/water-less barangays with high incidence of water borne diseases and resettlement area, and the second is the Rural Health Centers without access to safe water. 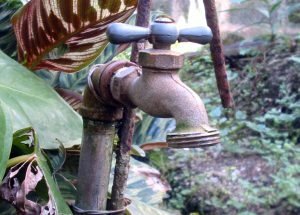 For the water-less barangays, the beneficiaries in Region 8 is Bobon, Northern Samar which will be given P6 million; San Jose, San Vicente and Mondragon, all in Northern Samar, which will be given P2.5 million each, after their papers are processed. Also to benefit in the same thematic area are Limasawa, Southern Leyte with P5 million, Maasin City with P2.5 million, and Calbiga, Samar with P2.5 million. For the second thematic concern, Rural Health Centers or lying in clinics with no access to safe travel, the beneficiaries in Eastern Visayas, to be give P1 million each are Villareal and Zummaraga, both in Samar province, and San Julian and Borongan City both of Eastern Samar. MANILA – Following the Sunday night attack on the Kidapawan City Jail, the International Committee of the Red Cross is seriously concerned by the indiscriminate killing of bystanders and a Red Cross volunteer responding to humanitarian needs. Arriving in the area after it was declared safe and clear, a Philippine Red Cross (PRC) emergency response team observed a small number of people injured and property damaged by bullets that were indiscriminately fired in all directions. "An improvised explosive device left in the area then exploded, killing the volunteer ambulance driver of this team, Benny "Daddy" Balmediano, as they were carrying out life-saving response to those injured in the earlier attack on the jail," said Jean-Daniel Tauxe, ICRC Head of Delegation in the Philippines. "We deplore such events leading to injury and death of those who are carrying out humanitarian duties trying to assist the wounded. We would like to stress that civilians and humanitarian workers must be protected at all times," he added. The ICRC reminds all those concerned that the indiscriminate use of weapons negates basic notions of humanity. The ICRC and the PRC call on all those concerned to respect those responding to emergencies, including Red Cross workers. "It is tragic for a humanitarian worker, who is also a father and who is there only to alleviate suffering and save life, to be a victim of violence," said PRC chairman Richard Gordon. The ICRC is a neutral, impartial and independent humanitarian organization that strives to assist and protect victims of armed conflict and other situations of violence. It works with the PRC, its strategic local partner in the Philippines, to enhance capacity to respond to disasters and other emergencies. QUEZON CITY – A group of women advocates working in grassroots communities blamed Congress for the reported 50 maternal deaths in January in Metro Manila alone. According to Elizabeth Angsioco, National Chairperson of the Democratic Socialist Women of the Philippines (DSWP), the Department of Health report is quite alarming and should wake up sleeping representatives in Congress. “These deaths are caused by inadequate reproductive health services needed in preventing and responding to such complications and therefore, saving mothers’ lives,” lamented Angsioco. Angsioco stressed that these services are contained in the RH bill that has been continuously delayed for more than 12 years by Philippine Congress. “It is frustrating that Congress is quick to act on political issues like impeachment but very slow when it comes to legislation that will address ordinary people’s needs, especially those of poor women,” said Angsioco. DSWP head extends blame to President Aquino, who has been too preoccupied with removing the chief Justice who heads a supposedly co-equal branch of government, and in the process seems to have set aside his promises to the Filipino people, especially to those that will redound to their well-being like the RH bill. Moreover, “the deaths of these mothers are on the heads of these government officials. How many more mothers need to die before those who are mandated to save them begin to act?” Angsioco asked. Lastly, Angsioco urgently called on Congress to put RH bill into vote. “For once, our political leaders should do something for mothers, especially poor mothers who are dying every day due to pregnancy and childbirth-related complications,” she ended. TACLOBAN CITY – The Department of Labor and Employment Regional Office No. 8 and the Eastern Visayas Occupational Safety and Health Network (EVOSHNET), recently forged a budget partnership agreement in pursuit of President Benigno Aquino III’s thrust to integrate citizen participation in the budget process as a means of enhancing transparency and accountability in the allocation and utilization of public funds. The parties were represented by DOLE-8 Regional Director Exequiel R. Sarcauga and EVOSHNET President Angelita N. Dimzon during the signing of the agreement on February 15, 2012 at the Coca-Cola Plant, Tacloban City, DOLE-8 Information Officer Virgilio Doroja Jr., said. DOLE Regional Director Exequiel R. Sarcauga informed that the labor department is partnering with Civil Society Organization like the EVOSHNET to help enhance efficiency and effectiveness in government and to curb corruption through its efforts in monitoring agency programs, activities and projects. EVOSHNET is a non-stock, non-profit organization composed on occupational safety and health practitioners from private and government sectors, representatives from related professional groups, industry associations, employer groups, trade unions and related non-government organization within the region. “We are also forging this agreement in response to the directive of DOLE Secretary Rosalinda Dimapilis-Baldoz to pursue one of the President’s policy reform agenda on labor and employment, that is, the intensification of public-private partnership in labor governance,” Director Sarcauga added. The parties, through the agreement, have vowed to work in closely to make the government budget more responsive to the country’s development needs and pressing concern to alleviate poverty and improve the quality of public services, and to complement and reinforce each other in the evaluation and assessment of on-going programs, activities or projects of the department. TACLOBAN CITY – Engineer Angel Sia, district engineer of the DPWH 8 Leyte first district, informed that his agency will complete all the projects in the district within the time frame per directive from Public Works Secretary Rogelio Singson for all engineering offices across the country to finish all the projects within their area on or before June 30 of this year. Engineer Sia said that his office has received an allocation of about P54 million for various infrastructure projects within the first district of Leyte which covers Tacloban City and the towns of Alangalang, Palo, San Miguel, Santa Fe, Tolosa, Tanauan and Babatngon. DE Sia assured the public that the funds allocated by the central office would be used to finance on what he described as the five major infrastructure projects in the district. He disclosed that P34 million would be used for the concreting of the 1.5 kilometers San Miguel road section; another P5.9 million for the upgrading of the pavement of 280 meters starting from the town proper of San Miguel up to one of its exterior barangays which is Barangay Santol. Engineer Sia added that his office will also implement the upgrading of the 1.2 kilometers asphalt overlay along Barangay Guindapunan to Palo town center; P11.5 million at the Government Center; and the 127 meters asphalt overlay from Barangay Kiling in Tanauan, Leyte towards Tabon-Tabon-Julita Road amounting to P1.5 million. The District Engineer likewise recommended that commuters use the 1.5 kilometers Palo by-pass road in Barangay Salvacion to Baras road section to minimize the traffic in Palo. Furthermore, Engineer Sia informed that commuters may already use the 5-kilometers fully cemented Tigbao-Santa Fe road section as an alternative route going to Ormoc City, Carigara or Samar area. Moreover, Sia informed that the agency program engineer is currently making the master plan to complete the Bagahupi-San Miguel-Santol secondary road on or before 2016. The material section is now conducting monitoring on the quality of the projects to ensure that all projects are in accordance to the plans and specifications to ensure quality works, Engineer Sia concluded. 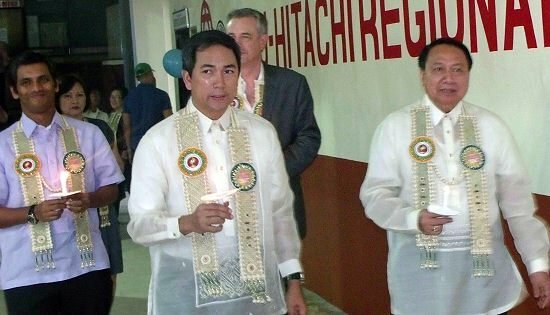 Leyte Governor Jericho "Icot" Petilla joined officials from Hitachi Global Storage Technologies and Eastern Visayas State University during the blessing and turn-over rites of the new EVSU-Hitachi Regional Laboratories Center at the EVSU Main Campus. Also in picture is Hitachi GST Philippines President and General Manager Chandramogan Anamirtham, Hitachi GST Director of Prototype John Herber, EVSU President Dr. Catalino Beltran and Leyte Normal University President Dr. Evelyn Cruzada. TACLOBAN CITY – Leyte Governor Carlos Jericho Petilla sees the partnership between state universities and Hitachi Global Storage technologies (Hitachi GST) not only as a booster to the country's education and workforce specifically in the field of engineering but also as a way to address the problem on job mismatch. Gov. Petilla, who were among those who graced the turnover and launching of the EVSU-Hitachi Regional Laboratories Center at the Eastern Visayas State University (EVSU) here, said that for state universities to be able to address the need for graduates that are presently required by industries, new and better facilities for the required skills and course are to be in place. The launching of the regional laboratories center also coincided with the weeklong celebration of EVSU’s 105th Founding Anniversary. “This is such an opportunity for EVSU to equip their students and further strengthen their quality of education here“, Gov. Petilla said. He otherwise lauded Hitachi officials led by Dr. Chandramogan Anamirtham, president and general manager of Hitachi GST Philippines Corp., for bringing this kind of partnership into the universities in the country. Putting up of the Hitachi Laboratories Center is made possible through the company's Integrated University Program (IUP) which provides scholarships, research grants and sponsorships, laboratory donations and on-the-job training to both students and faculty members. According to Dr. Anamirtham, the facility will bring new ideas to the students and their company is open to employ students or work with students and faculty with their research and he is quite impressed by the highly skilled workforce in the Philippines. All of the computer operated machines set up at the newly-launched Hitachi EVSU Regional Laboratories Center are operational and in good condition. Gov. Petilla on the hand urged EVSU to produce quality graduates, particularly in the engineering fields, to encourage companies such as Hitachi not only to employ graduates from around the region, but to set up and locate their facilities here. “If we can work to produce the adequate number of skilled workers they need, maybe then the next step is to bring their company here instead and not just bring our graduates to work in their facilities in Laguna,” Gov. Petilla declared. Hitachi GST Philippines is one of the country's leading manufacturers and exporters of magnetic heads (sliders) for hard disk drives, a computer storage component.